It is a crazy idea that entered my mind when a saw my five year old niece wearing a necklace made of plastic beads. The beads were the kind you put on a pegboard to form images. I had just finished making a bamboo curtain for my apartment. Since I could not find a bamboo curtain in any store I decided to make one from scratch using bamboo sticks and saw them into pieces. A small problem was that each ringlike part on the stem was solid and had to be drilled to get a string through. After sawing and drilling and putting bamboo pieces on strings I got a decent looking bamboo curtain. After having constructed my curtain and seeing my niece with a necklace made of brightly colored plastic beads I became obsessed with the idea of making a curtain of plastic beads where the colors of the beads would form an image like a mosaic. MosaiCurtain would be a good name for such a curtain. My first curtain was just beads in random order. It felt great walking through. To make a curtain with a motive I used grooves with marks for counting beads and a long needle to collect the beads onto a string. My niece really liked the curtain. 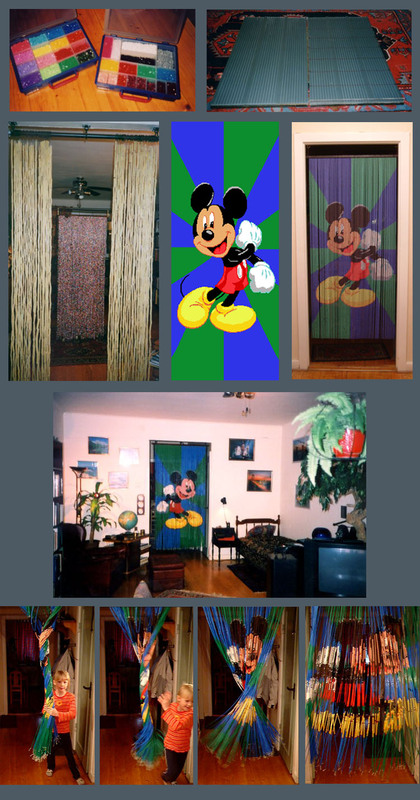 The Mickey Mouse curtain was great but the goal was full color depth to handle every type of image and for that more colors were needed and preferably a more automatic way of making the curtain. I made some attempts to mix paint and apply it to white beads and to build a machine to sort the beads. This was a hopeless task of course and the efforts were futile. This could have been the end of making a mosaic curtain with full color depth. I gave up and dropped the idea but after a year I got a new idea. If I couldn't make a curtain of real beads I could at least do a curtain that looked like it was made from real beads. The goal was to make a computer program that would analyze	an image and decide the color of each bead and then draw each bead the way it would look in its position with certain lighting condition and some small random horizontal displacements. The results looked promising so I ordered an Epson Stylus Pro 7600 Wide-Format printer from the Internet. To get the right feeling the stripes would have to be at least 3-4 mm thick. By printing on self-adhesive print media, applying the printout to a plastic sheet and then cutting the sheet into stripes the result should give a good idea of how a MosaiCurtain would look like. This method could also work for large-scale production; print on both side of a plastic sheet, cut away the material between the stripes and let the user assemble the curtain on a pole. Below is a preview of two of my favourite MosaiCurtains. More curtains can be seen by clicking on curtains in the menu above. The method of making these curtains was not suitable for putting an image on both sides of the curtain. Once again I was stuck and dropped the idea of making a real MosaiCurtain. It took many years before the obsession of making a MosaiCurtain came back. 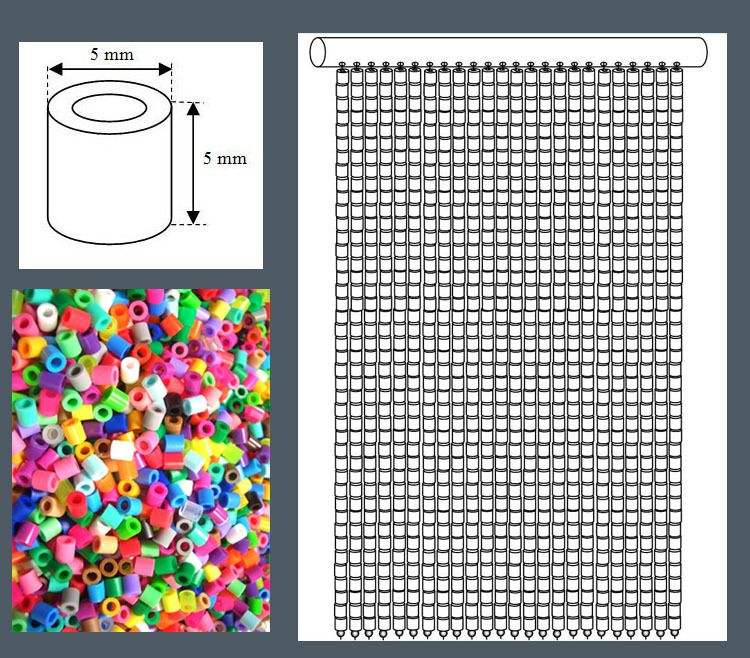 This time it would be a curtain made of physical beads in any color possible to print. The idea would be to use 3D-printing but I soon realized that with present printing technologies and prices it would be too expensive to make a full size curtain but at least I could experiment with 3D-printing and be ready for the future when you can have your own full-color 3D-printer. These models were made by feeding a STereoLithography file describing the 3-dimensional geometry to the 3D-printing software. Stereolithography derives from the Greek steréos meaning 'solid' and lithography comes from a printing technique with origins in printing by means of stone plates (Greek: líthos for 'stone' and graphéin 'to write'). The .stl file format describes the surface geometry through triangulation without any color information. The format exists both in binary and text form as a markup language. The mathematical models were done in Mathemtica and the bead models were done with 3DS Max before they were exported as STL-files. 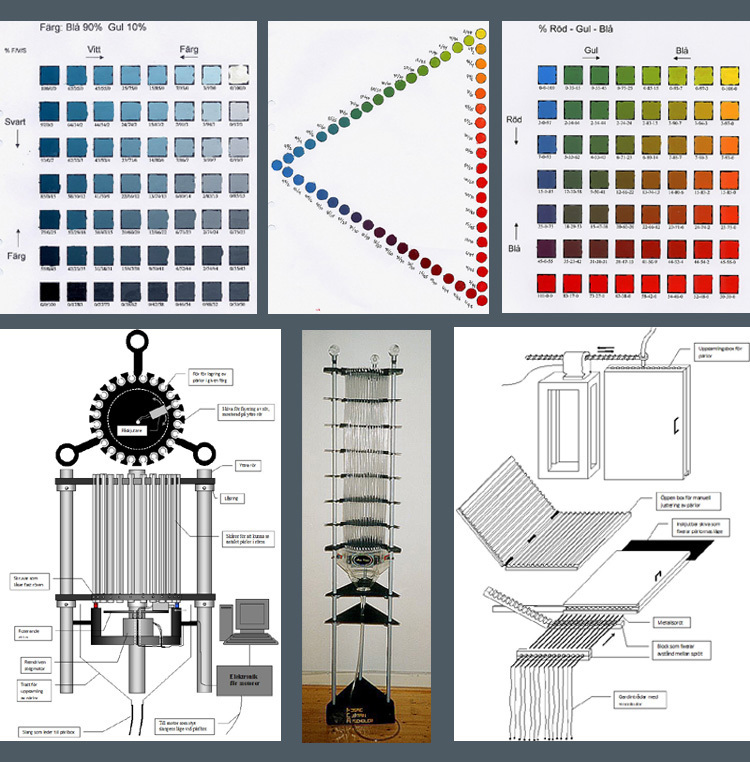 To get more than one color on the models another printer and another file format is needed. One of these file formats is Virtual Reality Modeling Language. By uploading a VRML text file with extension .wrl (short for "world") to a 3D-printing service such as Shapeways you can get a full-color 3D-model in sandstone produced by a method called powder bed and inkjet 3D printing. 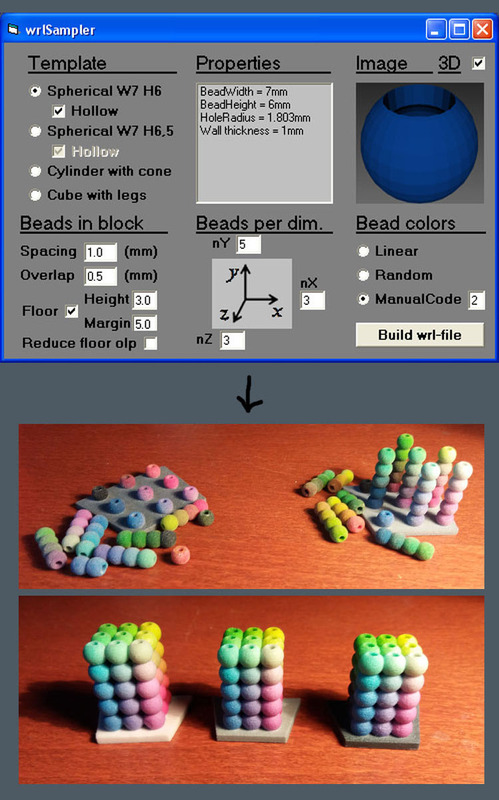 To test 3D-printing with colors and to find parameters for printing bead columns I wrote a short program that extended a chosen template file for a given bead type into a VRML-description of a block of beads. After much trial and error parameters were found for making columns that would not fall apart or become inseparable. The next step was to write a program that imported an image file and exported a .wrl file describing the block of beads based on parameters such as bead type, curtain width and separation between strings. The following image shows the program with two zoomed in details for negative and positive bead overlap and a view of a resulting bead block. A MosaiCurtain the size of a door would be quite expensive but some day I will make a MosaiCurtain. 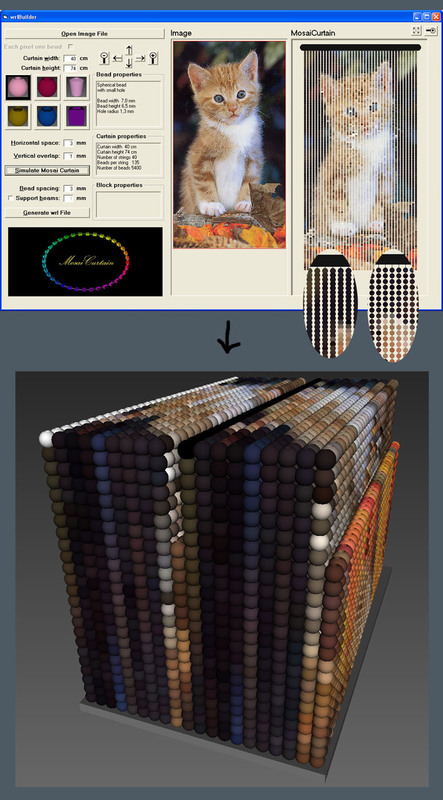 16½ years after my original idea of making a bead curtain based on the pixels of an image a company called XYZprinting launched the first full-color 3D printer suitable for private use, the 'da Vinci Color'. It is based on traditional 3D-printing methods (FFF) and inkjet technology. The introductory price was 3000$, not enough to stop me.